Steven (Chicagoland, United States) on 1 March 2016 in Landscape & Rural and Portfolio. I love this shot as the people in the foreground (bottom) really help establish the grand sense of scale for Mendenhall Glacier. Where these people are standing is from where yesterday's photo was captured. 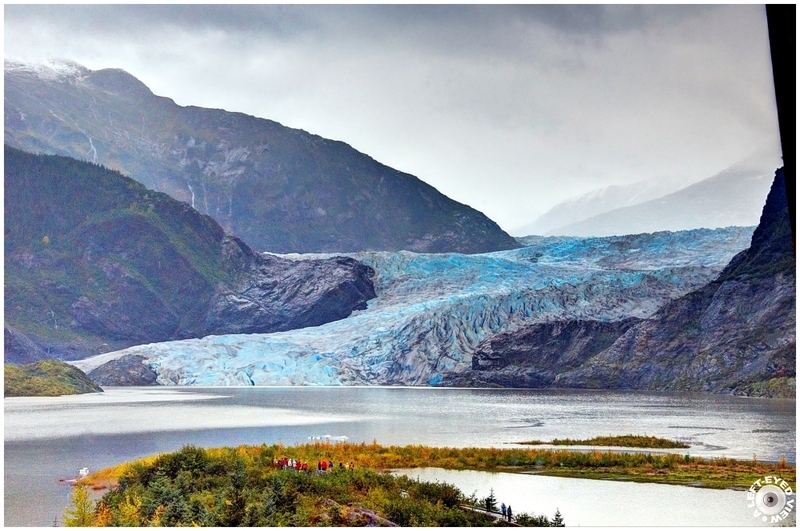 For more information on Mendenhall Glacier, read yesterday's post. Les minuscules "fourmis rouges" donnent l'échelle ! Impressionnant ! Wow - the majesty of nature - marvelous shot. I found them ! Spectacular !! Oh my goodness, the people really give the feeling of the vastness of this view. Fantastic! Wow...Beautiful composition . I can see the tiny people ( because you tell us ...). Very impressiv ! The tiny people help us understand the enormous size of this glacier. i remember walking to this viewpoint and then a bit further on the right, up a hill. very impressive indeed! Oh, Yes! I see them! such beautiful composition, layers, colors & atmosphere! They really give it scale. Nice shot. Great perspective Steven... makes me think of 'land of the giants' with the people being soooo small! The immensity of that glacier and mtns must have been breathtaking in person! What a capture... an awesome visual!! The scale, the pure beauty of the scene...mesmerizing. Have an happy week, Steven. An awesome view of this immense glacier. Thanks for showing this wider, grander view. That is superb. The tiny people really give us a sense of scale. Interesting contrast between the cold blues of the glacier and the green tones in the foreground. Fine composition. Why are tiny people allowed on the glacier? There should be a ruler at the entrance that says "you have to be this tall..."
Amazing! That really brings it into perspective. It is gigantic! A gorgeous image! Impressive sense of scale !! Great contrast.